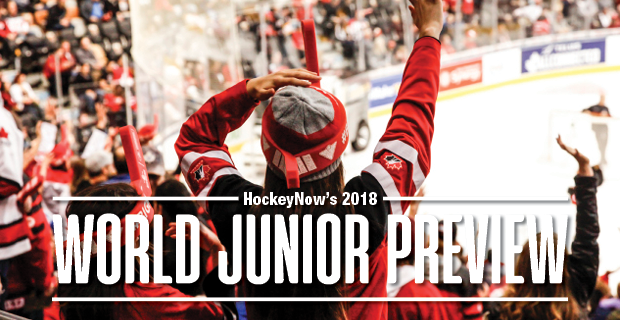 2018 World Juniors Preview: Will Canada’s New Approach Pay Off? It seemed like there were more people questioning Canada’s world junior roster choices this year than in previous years. For one thing, there doesn’t appear to be as much young star power as players like Cody Glass and Nick Suzuki, both top-15 selections in the 2017 NHL Draft, didn’t make the squad while Owen Tippett, who played seven games with the Florida Panthers to start the season, wasn’t even invited to camp. As well, Canada has shown preference to bringing on a younger goalie in recent years to learn the ropes from a veteran so they could take over in goal the following season, but Michael DiPietro, who many presumed would have been that youngster, didn’t get the nod. Instead, Colton Point, who is having an excellent NCAA season with Colgate University, made the team and will likely be the backup to returnee Carter Hart, at least to start out. Point will be one of three NCAAers on the squad (along with defencemen Cale Makar and 2013 HockeyNow Player of the Year Dante Fabbro, who is injured and hopeful for a recovery by tournament time), which we haven’t seen since 2007 when collegiate standouts Jonathan Toews, Andrew Cogliano and Daniel Bertram helped guide Canada its third in a string of five straight gold medals. As well, Hockey Canada has drifted away from taking draft eligible players both this year and last year. Julien Gauthier was the last draft eligible player to play for Canada during the 2016 juniors, but he was 18 at the time. The last time Canada went with a 17-year-old on its roster was 2015 when Connor McDavid and Lawson Crouse were part of a star-studded cast that won gold. This year, there doesn’t seem to be that generational type of player on Canada’s roster, but there is a collection of strong veteran players, many of whom will go on to long NHL careers. For starters, there are seven returnees (Hart, Fabbro, Taylor Raddysh, Dillon Dube, Michael McLeod, Kale Clague and Jake Bean) who Canada will rely on for leadership. Jordan Kyrou, Sam Steel and Tyler Steenbergen have had prolific seasons and will also add a lot to the Canadian lineup while Victor Mete can anchor the defence and will bring some valuable experience while he’s on loan from the Montreal Canadiens. Hockey Canada also brought on a number of players they didn’t even consider for the World Junior Summer Showcase. That list includes Steenbergen, Point, Alex Formenton and Drake Batherson. Of course, Raddysh wasn’t invited to the 2016 Summer Showcase, but went on to serve a big role with Team Canada, finishing last year’s tournament with six points in seven games. This looks to be a new way of thinking for Hockey Canada in forming their roster. There are only three 18-year-olds (Formenton, Robert Thomas and Maxime Comtois) who would be eligible to return next year, but with only one gold in the last eight years, perhaps some change was in order for the Canadians. All of the veteran talent in place certainly can’t hurt Canada’s chances as there will be several players who won’t have any problems adjusting to different roles in order to capture gold.